After 16 egg whites, 500 grams almond flour, 1,000 grams of icing sugar, and countless hours of whipping, folding, piping, waiting, baking and filling, I finally whipped up some decent macarons! This month’s theme for Aspiring Bakers is none other than macarons! To be honest, I’m not a huge fan of them – I had tried them in Paris and they were good, but they didn’t blow me away. I guess that’s mainly because they are extremely sugar-loaded – too sweet for my liking. The technique to make macarons can be a bit tricky – there are several important things to master while making macarons: making a good meringue; getting the right macaronage (this is the process of mixing in the dry ingredients into the meringue), and baking them. Many sites have helped me in baking these successful macarons – videos are excellent sources because they show you the consistency of the meringue and the final batter; websites provide step-by-step photos and a thorough explanation of the ingredients and steps taken to make good macarons. Video 1 – shows the consistency of the meringue and the final batter – the egg whites mustbe deflated, though I don’t use this method to get the consistency of the final batter, it’s a good reference material. Video 2 – shows the consistency of the meringue and the final batter – though I fold in all my dry ingredients at once, not batch by batch. Video 3 – a very good step-by-step video and clear images of a meringue and final batter. I obtained the macaronage using this method – fold several times then flatten the batter against the bowl. My final batter is more liquid – hence the top smooths out better than this video’s. Video 4 – video’s in French but shows a good consistency of the final batter. I used this method to pipe the macarons onto the baking sheet. 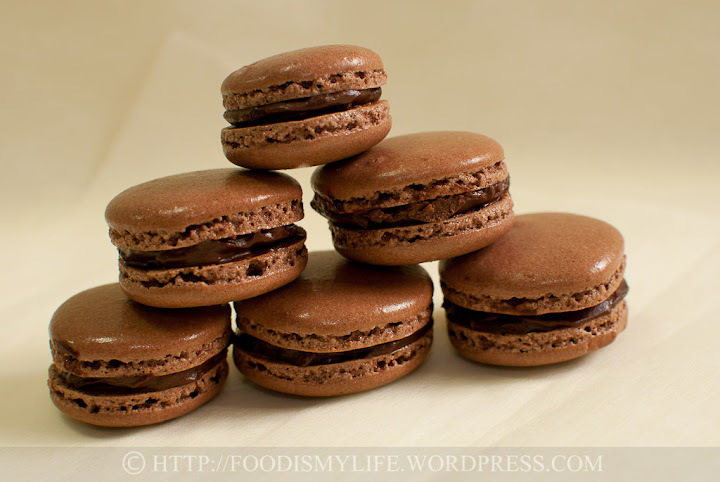 Tartelette – the original chocolate macaron recipe that I used from Helene Dujardin. Food Nouveau 2 – a very extensive troubleshooting and FAQ guide that everyone must check out before making macarons! Microwave method: Place the heavy cream in a microwave-safe bowl (glass or ceramic). Microwave the cream on medium for 30 seconds until the cream is hot. Add in the chopped chocolate and stir - the chocolate will start to melt. Place the bowl back into the microwave and microwave for 10 seconds. Stir the mixture and if there's any remaining un-melted chocolate, repeat the process (do not microwave for too long at one go unless you want to burn your ganache). Once all the chocolate has melted, add in the butter and let the mixture cool. If making the ganache a day in advance, cover and refrigerate it. Take it out of the fridge 15 - 30 minutes to let it soften before filling the macarons. Sift the almond flour, icing sugar and cocoa powder in a large bowl. Alternatively, place it in a food processor and blitz for several seconds to break up any lumps. It is essential to remove the lumps so that there will not be any bumps on top of the macarons. Once the meringue is ready, add in the almond flour, icing sugar and cocoa powder all at once. Using a large rubber spatula, fold in the dry ingredients until no streaks of dry ingredients remained. Do scrape the sides frequently to incorporate all the dry ingredients. The batter should be shiny, sticky, thick but liquid (this is what they like to call "lava" like batter): scoop up some batter and drop some it on to itself, the dropped batter should slowly sink and merge back with the remaining batter in more than 5 seconds but less than 20-30 seconds. If it sinks and merge back within 5 seconds, it is likely that you have over-mixed the batter. If it doesn't sink back, fold a few more times, and test again. It is a tricky balance - you can't under-fold and you can't over-fold either. Let the macarons rest for 45 minutes (weather in Singapore is humid, hence I let them rest longer, if the weather is dry, you'll only need to rest them for about 20 to 30 minutes). Touch them gently (top and the sides) - they should not be tacky / sticky and they will not be shiny anymore. Pair the macarons so that the same size ones are matched together. 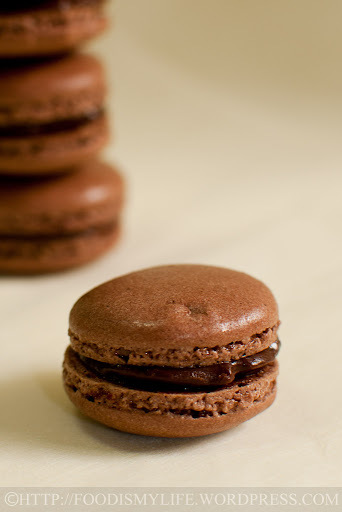 Place a heaping teaspoon of chocolate ganache (more if desired) in the middle of a macaron. Sandwich with the other macaron - gently twisting and pressing it down until the ganache extends to the edge of the macaron. Do not eat the macarons immediately! Place the macarons in a container and refrigerate them for 24 hours to help the flavours meld together - the ganache will help soften the macaron to achieve the crispy exterior, chewy interior texture. Take them out of the fridge 15 minutes before serving so that they will be at room temperature. Consume them within 1 week. You can use any type and combination of chocolate – milk chocolate, dark chocolate, mixture of 70% with 50% etc. I used all 70% because I don’t really like sweet macarons and I want the dark chocolate to offset the sweetness of the macarons. Cocoa powder – I used Dutch-processed cocoa, but it’s perfectly fine to use natural cocoa as well. This video shows you what it means to whisk egg whites into stiff peaks. The videos mentioned above are good references too. The figure-of-eight method of folding will not work here. I used a cut, fold and turn method. It’s essential to know the consistency of the final meringue – so you’ll know how much to fold. Check out the videos mentioned above. I learned this the hard way – under-baked macarons will stick terribly onto the baking parchement and the macarons will sink into their feet. Do you know that March 20 is Macaron Day? Happy Macaron Day in advance! You’re welcome Ruby! 🙂 I’m using a Nikon D3000 with a Nikkor 35mm lens. It’s an entry level camera, so it’s quite easy to learn and be familiarize with the functions. I’m actually considering upgrading the camera, but that will be in the far future as they are really expensive! Jasline – Thank you for the links! The deflector sounds like an excellent idea. Unfortunately my kitchen is tiny, and the only place that is ideal for taking photos. I have bookmarked the site you provided for Helene’s book. I will certainly get a copy once I’ve bought my DSLR! One more question if you don’t mind. What camera are you using? If you are getting a DSLR for food photography, I recommend getting Helene Dujardin (Tartelette)’s book, Plate to Pixel, on food photography, it’s a great book to learn about DSLR and food photography. When you mention deflector, do you mean this? It really depends on what is the mood of the photo you are trying to bring across. I like to use it as it helps to get more light on the food, making the photo brighter, cleaner and prettier. Thanks for your detailed reply. My chocolate macarons are not any shiner after being refrigerated. I have seen chocolate macarons in the stores that are matte, just like mine, so that is why I question all the dark and super shiny chocolate macarons I see on other blogs. I’m not that experienced with photography and I don’t have a dslr for taking pictures for my blog (I will buy one soon though). Do you find the deflector makes a huge difference for food shots? Hi Ruby! I’m glad you tried them and I’m so thrilled that yours turn out well. 🙂 I’m not very experienced in macarons baking, but from what I’ve research and read online, the macarons are shiny when you pipe them, and after drying them they would become matt. The macarons that I’ve baked came out matt, and they’re only a teeny weeny little bit shiny when light is shone on them. I think I have a theory why most macarons that you see are shiny in photos – most macarons are refrigerated for the flavours to develop, hence when they are taken out of the photos to be photographed, condensation might have occurred on the surface of the macarons, causing it to reflect the light shone on them during their photoshoot, making then more shiny in photos – I think that’s what probably happened to mine. When I took these photos, I held a reflector to eliminate shadows around the macarons, this resulted in more light shining onto the macarons (very common in food photography), maybe making them more shiny they should have been. Have you tried tasting macarons from your local bakeries? Are theirs very shiny to you? I’m sure your macarons still tasted delicious! 🙂 And I hope the above answer helps. Happy baking and take care! 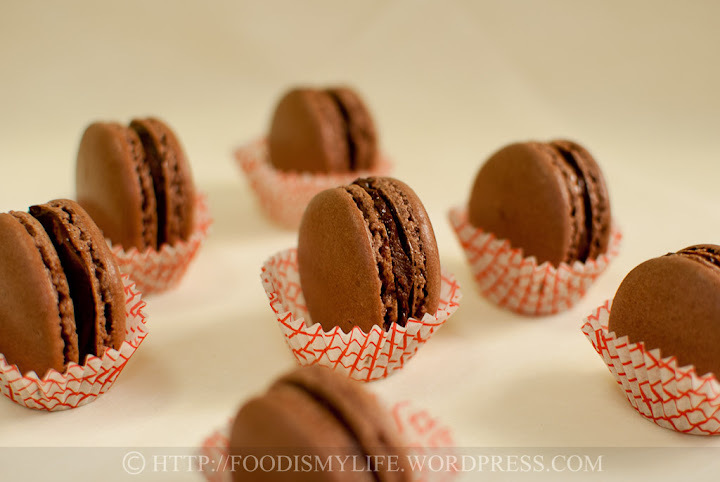 Jasline – I just made the chocolate macarons and they came out well, but my baked shells were dull and matte. I wonder if others are using enhanced photo software? I’ve made these many times and they’ve yet to come out shiny? Any ideas? Hi Jasline – very detailed recipe with helpful links. Thank you so much! Macarons are a pain to make, it took me 4 tries. They’re time consuming and when I’m finished, I always say I’d rather buy them, but making them is fun, especially when they come out right! 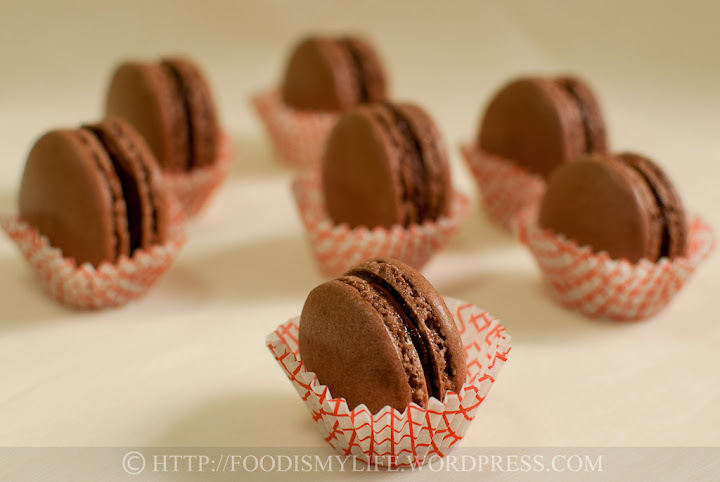 A wealth of information on macarooning in this post. Jasline, really appreciate your genreosity in sharing your experience. Those tips and notes are precious and will definitely help anyone who wants to try making these temperamental beauties. Your macarons look perfect. Beautiful macarons! And thanks for sharing all your notes! Thank you for your encouraging compliments (: Seeing all the wonderful and varied flavours they can offer is tempting me to make them again! Yum! Ice cream and creme brûlée sounds good! Haven’t tried making kueh lapis before… But I know it’s super tedious! Your macarons are beautiful. Good job. Once you get the hang of it they are not so bad and they are so versatile with all the different things to fill them! What a great resource you have put together! 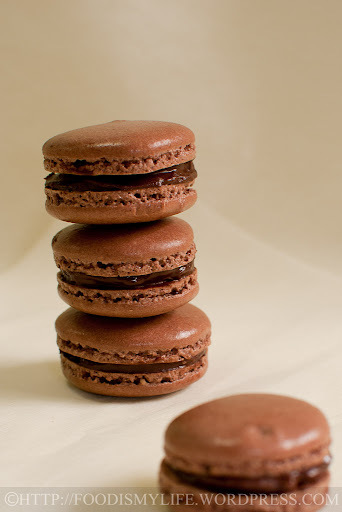 I finally tackled macarons after doing similarly extensive research and found that I almost psyched myself right out of making them… but then I did and I was so glad 🙂 These chocolate macs look wonderful – I want one right now! ice-cream, cream brulee, custard pudding, bread and butter pudding…. and good o’ kueh lapis!!! Hi Lena thanks for the compliments! I really learned a lot from all the macarons baking. Yea I can’t wait to try out some yolk base recipes.. Maybe ice cream? Haha. hi jasline, thanks for sharing all of your notes and experiences. There’s really so much to learn and explore, yes, really tricky, it seems that every step in making macarons have to be so careful and precise too. congrats on your successful macarons!! though i cant get to taste them, i’m pretty sure they taste lovely just as how they look! 16 egg whites? so the next challenge would be thinking what to make out of the egg yolks…LOL! Thank you so much for your compliments. (: Oh Bobbi I chose the prettier ones to take photos of. Hehe. I guess having to pipe 5 batches of these improved my piping skills! And Wow you whipped your egg whites by hand? That’s amazing! I’m not sure if I can ever do that! You should check out Helene’s (Tartelette) site. My skills are only a fraction of hers! (: take care Bobbi! Wow! Sounds like hard work! But they look so professional and shiny and delicious!! These are such pinnable and gorgeous pictures! I am so impressed with how uniform they turned out! You’re welcome! I hope they’ll be of some help to you (: all the best in macaron making! Thanks!! Can’t believe I did it too. I was so near to giving up.. Haha. Ooh I hate the sifting also! I wish to get a food processor soon haha! Lovely macarons and thanks for sharing your experience and tips on macaronage! woah, jas! 😀 they look amazing! hahaha..i’m sorry to come here without asking if you’re alright with it but i saw this on facebook and it’s awesome! jiayou jiayou! Brava!!! I’m so impressed my our macaroon finesse and skills! I’ve yet to make these babies, it’s a challenge I was hoping I might encounter at culinary school with some decent tutoring! Brava!!! V inspirational!! !